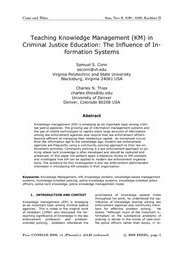 Knowledge management (KM) is emerging as an important topic among criminal justice agencies. The growing use of information management systems and the use of mobile technologies to rapidly share large amounts of information among law enforcement agencies now require that law enforcement officers become efficient at managing their intellectual capital. As movement occurs from the information age to the knowledge age, modern law enforcement agencies are frequently using a community policing approach to their law enforcement activities. Community policing is a law enforcement approach to policing where tacit knowledge is often developed and should be captured and preserved. In this paper the authors apply a literature review to KM concepts and investigate how KM can be applied to modern law enforcement organizations. The audience for this investigation is any law enforcement administrator interested in introducing KM concepts in their organization.